As you arrive, you will be greeted by your own private parking space and will enter to find an exotic central tropical garden. Within the house, there is a traditional feel to what is a thoroughly modern property, with tasteful Thai decor, teak flooring and complementary colour schemes. Traditional in design perhaps, but undoubtedly modern in facilities, with a Samsung curve satellite TV, DVD Player and even a Netflix subscription! And if that wasn't entertaining enough, a dedicated games room with table football and a pool table is available for your exclusive use! There is a vast kitchen with all the latest mod cons, and a large centre island which doubles up as a breakfast bar for when you get a little peckish, through our on-site chef will be happy to cater each mealtime! You'll also have a personal villa manager and a maid at your service, included in the price. Six fabulous bedrooms line the expansive pool, each with hardwood flooring and impressive vaulted ceilings, creating a hugely spacious and airy ambience. The master bedroom has a double queen size bed, a lounge area and a connected office space which could be transformed into an extra bedroom if required. It also includes a beautiful outdoor patio area with a massage bed and a stunning Jacuzzi bathtub in the ensuite bathroom. All six charming, air-conditioned bedrooms have a fitted wardrobe, writing desk, walk-in closet and satellite TV with DVD player, under beautifully exposed timber ceilings. The ensuite bathrooms shimmer with bright marble flooring and both indoor and open-air showers, as well as 100% cotton bathrobes and slippers and luxurious toiletries. Throughout the garden and terraces, colourful flowers add a sense of life and energy to this tropical paradise. Around the pool, there are plenty of sun loungers, pool towels, a gas fired BBQ and even a pool shower. The traditional Thai Sala offers Bluetooth speakers, a casual seating area and a ceiling fan to keep you cool no matter the weather. On the fabulous veranda, you will find a granite-topped bar with a sink, fridge, stereo and even a dartboard! Perfect for relaxed evenings enjoyed with a glass of wine and good conversation. 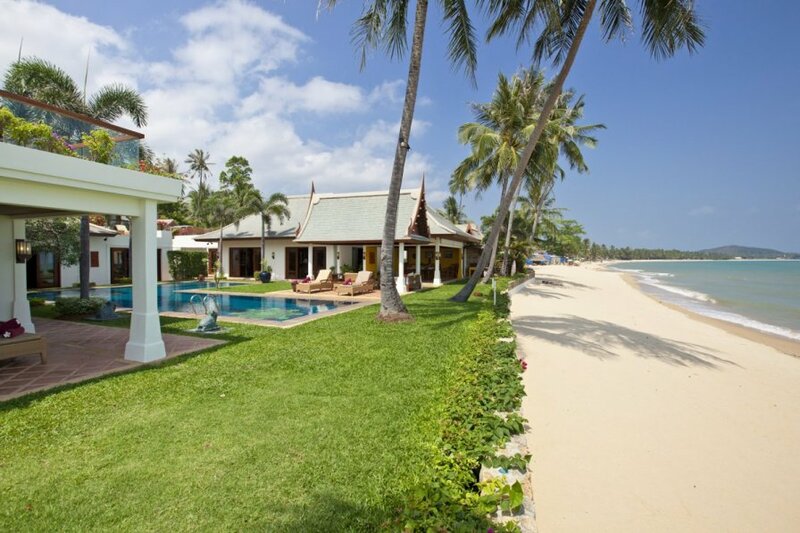 Villa Tansanne is located on the tranquil Mae Nam beach, a five-kilometre stretch of palm-lined, pristine white sand famous for its glorious sunsets.